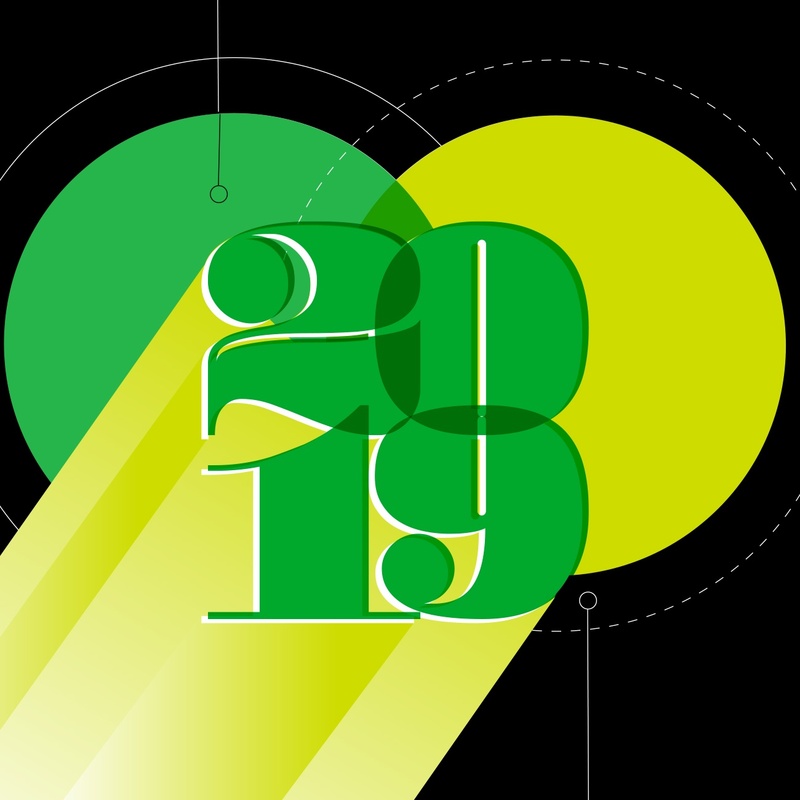 In the past year, we’ve featured best-selling authors, influential bloggers, and journalists who use Evernote to capture ideas, manage research, organize plot elements, and write. You don’t have to be Neil Gaiman or Susan Orlean to make an impact with your writing. These days, we’re all writers. 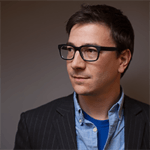 It doesn’t matter if you manage a corporate blog or do content marketing. That’s why we’re very excited to announce our integration with CoSchedule, a solution for scheduling content. Now, you can turn your Evernote notes into real WordPress blog posts. 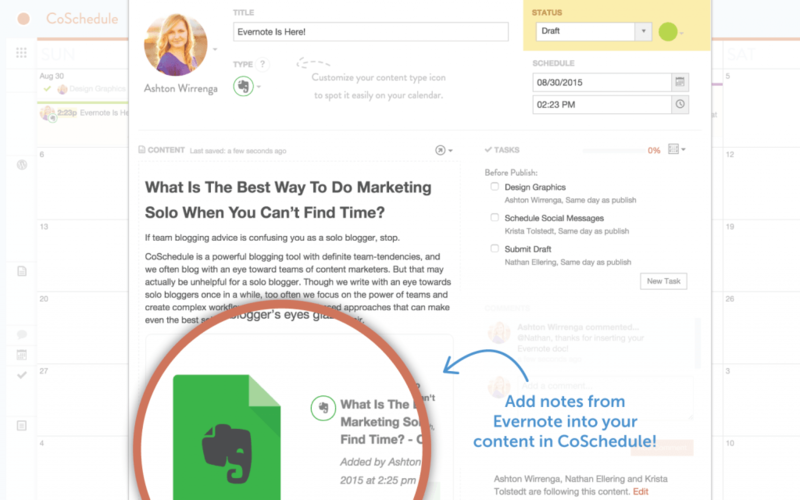 Here’s how you can plan, create, publish, and share content with Evernote and CoSchedule. There are tons of ways writers benefit from writing content using Evernote, from the initial idea to final edit. 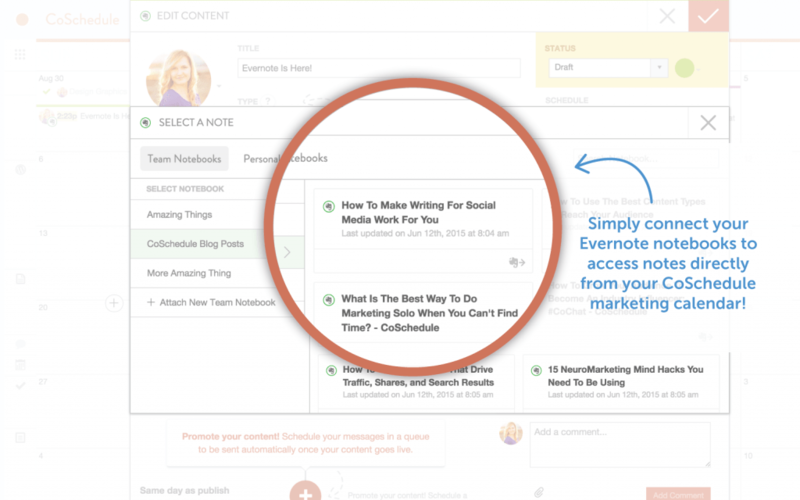 Writing blog posts in Evernote is easy. It’s the central place to gather ideas, inspiration, and research that help you write content virtually anywhere, on almost any device. The challenge was publishing. Getting content from Evernote into WordPress required extra time and effort to copy, paste, and reformat. Now, you can add blog posts you write in Evernote to CoSchedule and easily turn notes into WordPress blog posts. Add images to your blog post and they will auto-magically import from Evernote into WordPress. That means no more copying, pasting, and saving images out of Evernote and uploading separately. When you connect your Evernote notes as blog posts through CoSchedule, graphics and images will automatically import into your WordPress media library as real media files. When you create content in Evernote, it’s easier than ever to export it directly into WordPress, as HTML, and PDFs. 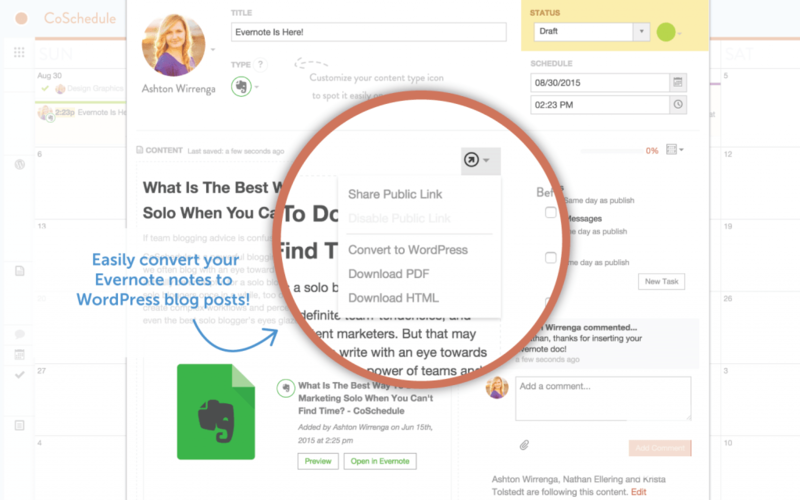 You can also share content with guest authors or contributors using a public link. Your content efforts take on new meaning when you see deadlines and dates attached to them. Easily drag and drop your Evernote notes into CoSchedule and turn notes into content destined to be published or shared. Once content is scheduled, you can tailor your communication, workflows, and deadlines accordingly. Quickly attach notes created In Evernote notes and notebooks to your existing content in CoSchedule. For many businesses and writers, blog posts are just one element of writing. 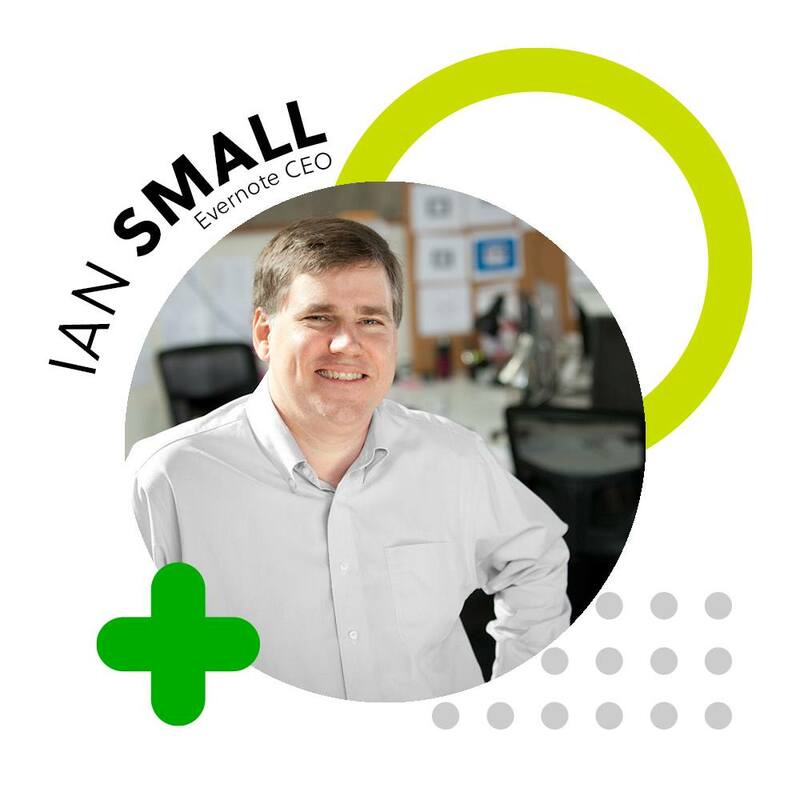 No matter what you are creating, Evernote and CoSchedule work seamlessly together for all types of content including advertisements, email copy, landing pages, graphics, e-books, and videos. 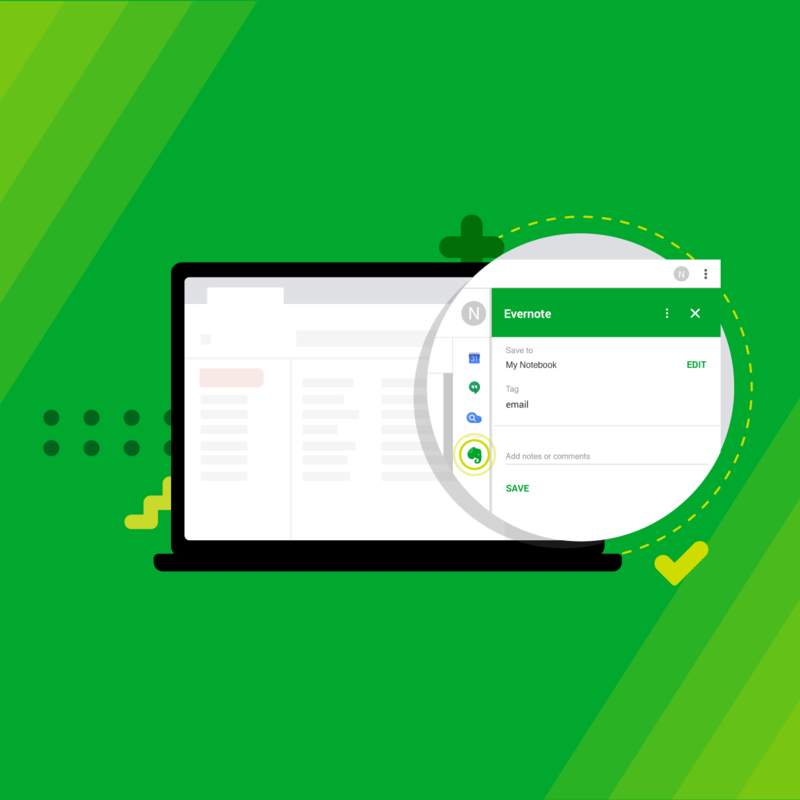 Whether you use Evernote Basic, Pro, Premium, or Evernote Business, it all works with CoSchedule. 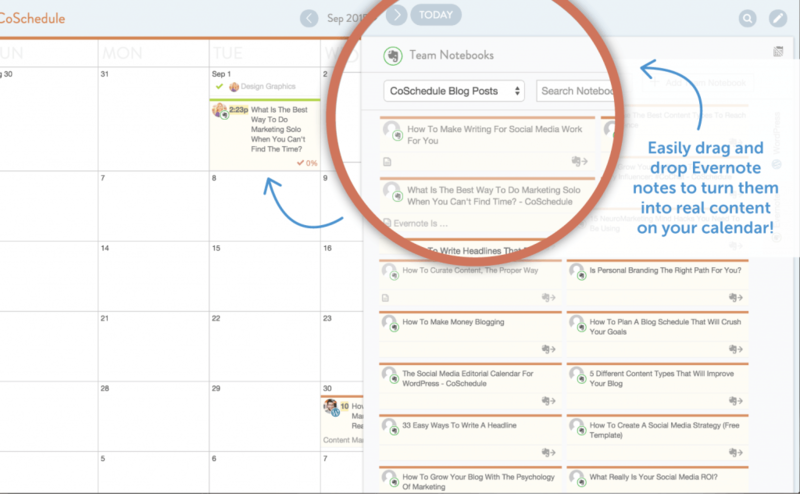 How are you going to plan, publish, and promote content with Evernote & CoSchedule? Share your story or questions in the comments below.